Some people may criticise Anna Hazare and his team members by saying that their mission of getting the Jan Lokpal Bill passed, has failed as they could not achieve their target. But, I beg to differ with them, as even though Team Anna has been disbanded by Anna Hazare himself, but they have successfully enlightened the crores of gullible people by their sincere and steady campaign and wide coverage given to it by the print and electronic media, to what extent corruption has been spread and who are the real culprits for this wide-spread mess caused by illegal means. We should also remember that we are living in a democratic country and not in Sudan or Egypt or Kenya where people resort to violence to get rid of tyrannical and autocratic rulers. Democratic systems have their limitations and we are suffering because of that. 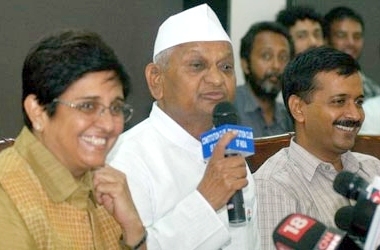 Only non-violent and democratic methods can be adopted by the people here even to lodge their protests and highlight their grievances and that is what Team Anna has done throughout their tireless campaign. Since the govt. of the day has not woken up and tried to give serious thoughts it deserved to mitigate the bruised sentiments of the people, now it is for the people to impress upon the crusaders of this movement to take the next step i.e. to make a political party and also take all necessary steps so that by the time of next general elections are announced, the new a party is well prepared – not only to give the forces of evil a tough fight and show them the door, but also win a sizeable number of seats to ensure that they are in a position to have their say. I would also like to request Swami Ramdev to join hands with Anna Hazare so that they fight the next election by joining hands.